Yesterday we returned from Wales where we had a wonderful time: fairly good weather, good food and we made lots of fun trips to castles, museums and other local attractions. The cottage we had rented was great as well. It was clean, well stocked and it had lots and lots of quilts! 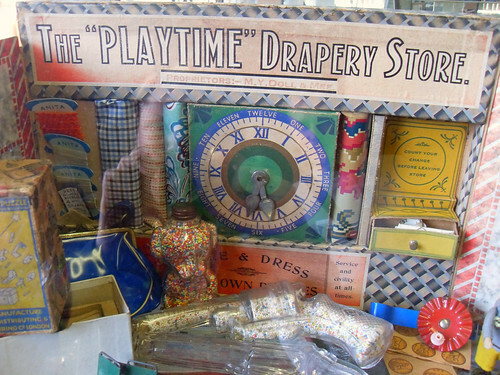 On our visit to Bletchley Park (which is nowhere near Wales but we stopped by on our way to Wales) I saw this wonderfully cute 'Playtime Drapery Store' which I guess is from the 1930's. I also stumbled upon a Manbroiderer avant-la-lettre. 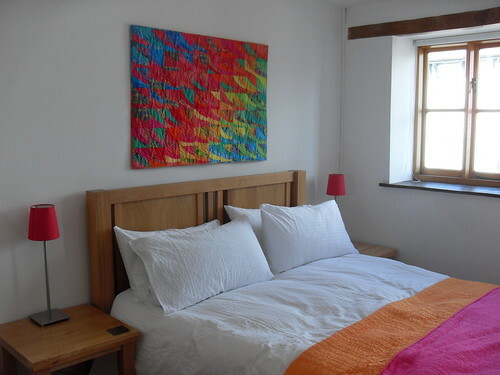 This is one of the bedrooms in the cottage we had rented. Every bedroom had matching bed quilts and quilted wall hangings! Later this week I will write a bit more about some crafty stuff I did (and mostly didn't) in the last couple of weeks but I had to sneak in this next 'me and my owl' photo in this post! ooh that guest house bedroom looks wonderful! The owls.....such beautiful creatures...so happy you had such a lovely trip!! And the playtime drapery store...can you imagine...I've never seen anything like it before! @Sarah I wasn't even aware there was a Bletchley Quilting competition! A 'coded' quilt would be awesome though so I must remember to check out those entries as soon as they are online! My husband wanted to visit Bletchley Park because of all the code/decoder stuff there. That wall hanging is astonishingly gorgeous! Would you mind emailing me with a link to the pace you stayed? 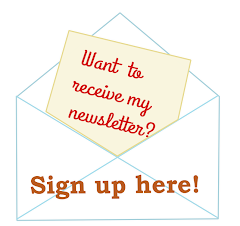 @Ruth just sent you an email! And if anyone else is interested: http://www.hayseedhouse.com/ I think it was one of the best cottages we ever stayed in. Awesome! I came nose to beak with an owl in Ireland this year too. Can't wait to hear more about the trip.